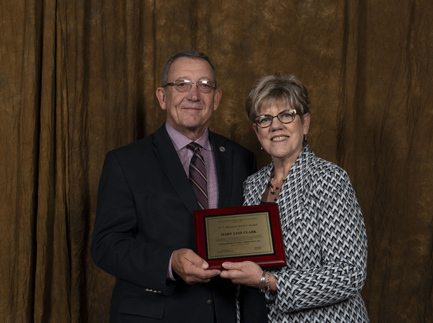 Troy, Mo., October 15, 2018 -- Mary Jane Clark, former communications manager of Cuivre River Electric Cooperative (CREC) in Troy, was honored with the A.C. Burrows Award by the Association of Missouri Electric Cooperatives (AMEC) at that organization’s annual meeting Oct. 11 in Branson. The purpose of the award is to recognize directors and employees of electric cooperatives for outstanding service to their cooperative, community and service areas. Those who received the award were selected because of their leadership above and beyond the call of duty to strengthen and improve the economic and social conditions in their areas. Clark, who retired in May this year, had an extraordinary, award-winning 30 years at CREC. She was elected as a member of the Touchstone Energy Standards Committee from 2003-2009, Council of Rural Electric Communicators from 1990-2000 and as co-chairman of the Missouri Electric Cooperatives Advertising Committee since 2003. Clark helped coordinate CREC’s annual member survey since its inception in 1995, adding the ACSI component in 2002. She expanded opportunities for high school students through the Youth Tour essay contest and the CYCLE program. Clark was instrumental in launching the Operation Round Up program and the accompanying Cuivre River Community Trust and its board, beginning in 1997. The program has awarded more than $5 million in grants to individuals and organizations as of December 2016. The award is named for the late Audrian Cleon Burrows of Van Buren, Mo., who rose through the ranks to become general manager of the Association of Missouri Electric Cooperatives, which is the statewide service organization for Missouri’s 48 electric cooperatives. Burrows served in this position from 1968 to 1976. He was recognized as an outstanding leader in rural electrification and as a distinguished individual who dedicated his life to helping others. The Association of Missouri Electric Cooperatives, Jefferson City, is the statewide service organization for Missouri’s electric cooperatives.